Don't you just love Susie Surprise! She's the new member of The Greeting Farm family. I've also included not just the Susie Surprise stamp but also a great Digital Kit called also from The Greeting Farm. 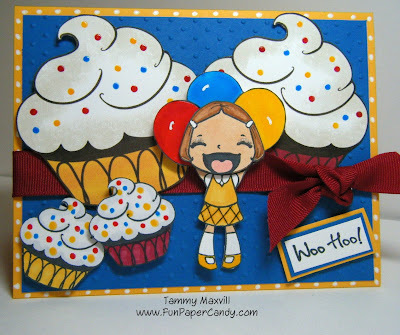 I've had a lot of fun with the Cupcake Party Tray digital kit and was super excited to see Susie Surprise since I knew she'd go perfect with the kit. Hop on over to The Greeting Farm and see all their new stamps released today! Let's talk candy! Since today is my first day of being a Spring Gardner Design Team member for The Greeting Farm I wanted to share my joy and give away some candy. Since I know you will love Susie Surprise and I know you will want to welcome her to your Greeting Farm family I'll be offering Susie Surprise up as some Blog candy. And well since you can't just have Susie Surprise I'll be giving away the Cupcake Party Tray digital kit as well. WooHoo! I'm so excited for whoever wins. You'll have a lot of fun with her and the digital kit. Here are the rules...Just leave a message on this post and give me a shout out. Let me know what you think of Susie Surprise. That's it. No other posting just leave a comment. I can't stand the suspense of finding out who wins so I'll have the drawing open until Friday April 3rd at 9:00 p.m. CST. I'll announce the winner shortly there after. Good Luck to everyone. Thanks for stopping by and taking a look at Susie Surprise. Hi there! I was blog surfing (pushing next blog to see what comes up) and found you! This is really neat! I love your work. I am going to share your site with some crafty friends. It would be fun to win the drawing too! What a happy card! Totally put a smile on my face. Gosh what a lovely little addition to The Greeting Farm family. She is very cute and very 'chirpy'. Hip hip hooray Susie Surprise. I CANNOT stand this any more! Waaaay too much happiness for 6am, I'll have a hard time coming off all this TGF sugar rush. heehee! Tammy! What can I say without sounding like a broken record?!? You know I LOVE LOVE LOVE your work, it's always so perfect. Your choice of layers are your signature, my friend. Rock that farm! How fun. I'm all about cute and crafty. Susie Surprise is adorable. I was wondering where the giant cupcakes came from! Love your Hybrid card! Happy First day on the DT! Woo Hoo! I'm so happy for you! Susie is such a cutie! Love it! You scream, I scream, we all scream for CUPCAKES! She just makes me giggle! I love your blog- it was the first craft blog I came across and started to follow. You have great ideas! Have a great day! she is awesome isn't she!!! i already had my heart on the never ever set, and was up late last night and bought it right away! but i can only buy one set at a time (or the hubby has a cow lol) but suzie is on the wish list for the very near future! Hi Tammy!! I love ALL of your designs and cards!!! Keep them coming. Everyone i'm sure loves checking out your blog. Congratulations again.. Your card looks great!! The cupcakes look yummy and Susie Suprise is so cute. What an awesome giveaway!! Good Luck everyone! Congrats on making the DT...great card! I was thinking of purchasing this set...it would be wonderful if I won it. Super cute, love that Susie!! Congrats on the Design Team, you work is AWESOME!!! THis card is amazing!!!!! Wow, wow, wow! I adore the giant cupcakes and the way you created highlights on the balloons with your white gel pen! Simply adorable! I wasn't sure about the Susie cupcake at first but now I definitely need her! The face and the cupakes are just too perfect for too many occasion! I love the bright colors, the huge cupcakes are totally rockin'!!! Love it! Can't wait to see more of your creation. Awesome card Tammy!! I love the Susie Surprise set!! The cupcakes on this card are so cute!! I like the idea of pairing it up with the digital cupcake set!! GREAT idea!!! Hi Tammy! Your Susie cards are simply adorable. I love your layout and pretty colors. Fantastic job coloring the images too. . .they're perfection. . so bright and vibrant! Whoohoo, it's our first day of being bona fide DTs for TGF! How fun!! Can't wait to see more of your creations!! You have such cute cards!! This is another cute set as well! Thanks for a chance to win! OMG!! Yummy Blog Candy! =) Your cards are super cute!! Congrats on being on the Design Team.. Can't wait to see what you come up with next! That's just so creative of you. Love this combo. How exciting to be on the Greeting Farm design team!!! I am addicted to that site. Got sent over from the Dark Mermaid to see your work and was happy to see blog candy, too! Have fun! Oh my! she is too sweet! Love your card and your blog will now be a daily visit! Thanks for sharing! Oh wow, this totally put a smile on my face!!! Love your cards and love the new set by Marie!!! Givin' you a big SHOT OUT! (^O^) and hope you're having a "happy day like Miss Susie!" Ok, so it takes me FOREVER to finally stop by your blog today but I'm here girly! I knew this would be one of the sets you got when I saw it (it looked like a "you" set)! LOL! Now, I NEED it! Hehe! And that digital paper is adorable! We were just talking about that the last time we chatted on the phone...did you ever get a new printer? I think it is a wonderful addition. Love that face. I love Susie Surprise! She is so cute and you can do so many things with those cupcakes! 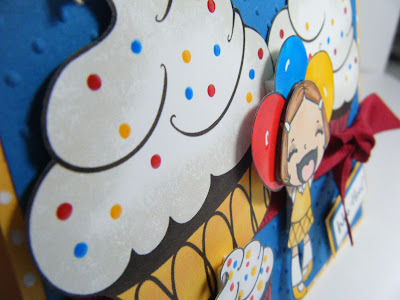 I love the card you did with her and all of the cupcakes! Hi Tammy! I think Susie is pretty cute! The cupcakes are looking pretty yummy too. Thanks for the chance to win. love that cupcake digi! I just ordered it and love it!!! too bad I didn't notice your blog candy until now...but the susie surprise is perfect match! thanks for doing this great candy! Susie Surprise is super cute! I love cupcakes. So adorable!! The cupacakes are too cute. what do I think of her?? I LOVE her! I think she is so cute yelling for her candy! What a great give-away, thanks for a chance to win it. I think this stamp is so much fun. The way you have coloured her and added her to your card has really brought her to life.